This week's 'Why I Love This Photo' is a little different to the previous couple. The last two images in this series featured skiers, Master Patel on the Altiport last week, with Gilly and John off-piste the week before. This week, as you can see, is more about the scenery and meteorological conditions. It was captured very late in the afternoon at the end of January last winter. I had been teaching a client over in Courchevel, where we finished the end of the lesson at the top of Saulire. This meant they could enjoy their final ski of the day on quiet pistes back down to Courchevel, and I was able to do the same on the Méribel side. My days of being a boy racer blasting down pistes at breakneck speed are over, some may joke that they never existed at all !?! If I get a chance to free ski I love to cruise, at the same time looking out at the scenery. Late afternoon in deep winter is a very special time of the day. Why? Firstly, the pistes are dead quiet due to people ending their day early in a happy but fatigued manner, or they are kicking off the apres ski. Quiet pistes equals bliss for me. Secondly, the lighting. The tones in the sky turn very subtle, looking in any direction. If there is still direct sun around, it is beautifully soft and low which gives interesting effects. Next time you have a ski holiday, how about trying to stay out as long as you can to experience this. Either take a longer lunch to help pace your exertions. Or have an apres ski drink on top of the mountain, instead of starting down in town. So why do I love this photo? It reminds me of a fantastic day at work, and a privileged commute home. I love that low sunlight, especially how it catches the alitport piste below, the side of the apartment buildings, and finally the sea of cloud. How mesmeric are seas of clouds? 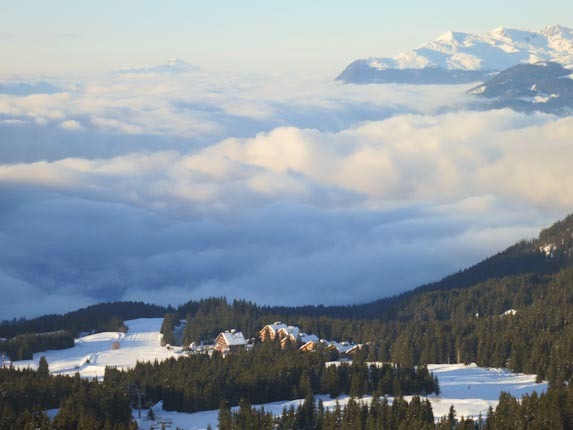 Talking of being mesmerically affected, have you seen the webcams out in the Alps the last few days? It looks AMAZING. Old fidget pants here in Leamington Spa is getting very excited. The countdown continues at a great pace, only 12 days to go before heading off to Méribel. If you enjoyed this article, you may like to read a post I wrote in the middle of last winter called 'Oh, Those Crazy Mountains'. Please feel free to share away on Facebook, Twitter and Goggle+ by clicking on the social media icons. Or you could leave a comment below, it's dead simple. Have a great week everybody, and keep dreaming of those gorgeous skiing days and views, it won't be long now. Martin.